This is a Guest Post by Sven Myrin. Notes: I designed the Verhaegen map with Photoshop 7.0 but using almost exclusively CC3 elements including those from Pro Fantasy Annuals and free online resources. Practically all the elements I added to the map were modified in some way as to introduce blending effects that I found pleasing. Background elements such as the ocean, base land, road, and rivers were generated thru PS7. 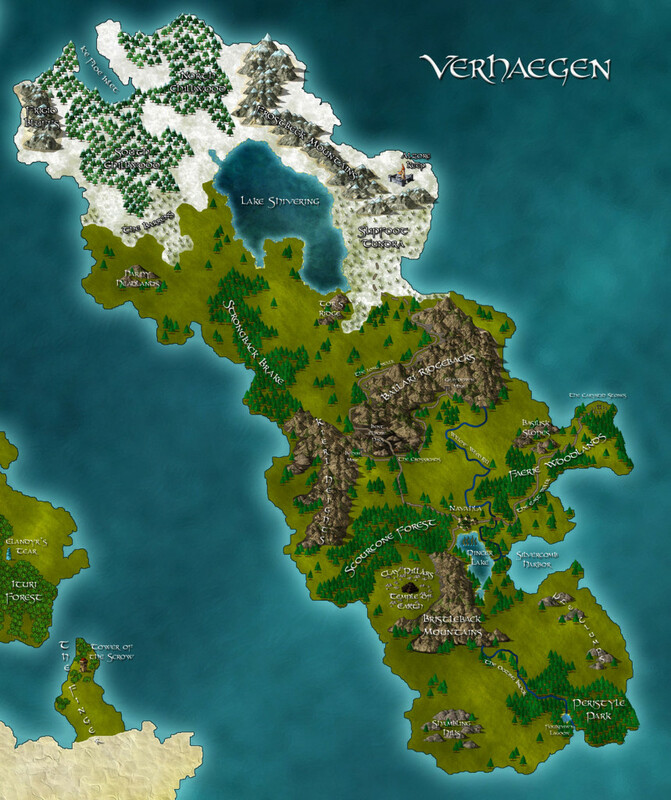 Summary: Verhaegen is the largest of several islands off the main coast of the world of Maroon (the focal point of a 4E D&D campaign I just started running). The island is still remote and wild enough that no major kingdom has laid claim to it. Instead, a small community of explorers and fortune seekers has established the free town of Navahla near its central point. Navahla: Small town of about 500 residents including a self regulating armed force that stands watch against marauding creatures. The town is largely financed by mining and trading operations. Two trading companies vie for political control of the town each looking for ways to gain the upper hand on the other. Adventures and mercenaries make up the bulk of the population as work and exploration is plentiful. Scourcone Forest: The pines that grow in this forest produce a robust variety of cones remarkable for their strength. They are often gathered and used as grinding tools. The nuts of these pines, although difficult to reap, are highly nutritious. The forest is the home of many dangerous creatures as well. Faerie Woodlands: These woodlands are broken into a few patches spread along the east walk. Fey creatures call them home and although not too dangerous, have proved trouble at times. Pincer Lake: A lake famous for a creature that stalks the unwary. It attacks only during the spring and summer months and is often debated in the local taverns. A reward has been offered to anyone that kills the beast but it has gone unclaimed for six years now. Silvercomb Harbor: A calm and naturally beautiful harbor begs the question; why isn’t Navahla built at its shores? Trade goods are either run up and down the Willow Reed Rill or hand carted north and then west along the east walk. A construction project to connect the harbor with Pincer Lake is ongoing. Progress has been slow. The East Walk: The east walk is a trail turned dirt road due to high traffic. It runs east and then northeast of Navahla, thru the Faerie Woodlands, past the Basilik Slopes and all the way to the Caryatid Stones. Travel along this route is usually safe except for the occasional curious fey creature. On occasion, bandits use the road but are swiftly dealt with. The Long Walk: The long walk is indeed a long road. It extends south and north of Navahla, past the crossroads and over the Ballari Ridgebacks at Bent Elbow Pass. It continues north until its path is lost to the Slipfoot Tundra. The road is subject to much traffic between the two mines (Bedim and Graydown) and is well patrolled. Basilisk Slopes: Despite the name, there have been no actual basilisk sightings reported in these plain hills but there are a few statues scattered about the landscape. Nevertheless, the name has had the effect of keeping many explorers from scouting them in any great detail. The Caryatid Stones: A circle of stones carved to resemble faceless humanoid figures stands here. Strange magic effects have been reported in and around the area. Investigation into the site had not uncovered anything unusual although several people go missing here every year. Clay Pillars: The Clay Pillars are a strange rocky outcropping that permeates the land in this area. They are not natural and hide an assortment of earth elemental kin. Passage between the pillars and the Temple of Earth is harrowing at best. Temple of Earth: This ancient earth construction dates back many hundreds of years. No one knows what its purpose is nor has anyone succeeded in plumbing its depths. The Prophecy of Lazim the Mad makes mention of it but the relationship between the prophecy and the temple is still unknown. Bristleback Mountains: Home to a savage tribe of orcs and giant kin, these mountains have been avoided by explorers for some time. Recent, well-armed forays into the area suggest that valuable minerals are present just waiting to be mined. The high incidence of contact between tribes of orcs and ogres has put such a venture just out of reach. can I use your map for my campaign in a pbp game? This map was a guest post from Sven Myrin. He didn’t specify any copyright restrictions that differ from my standard one. So as long as your pbp game is non-commercial in nature and you give credit to the artist, I think you’re safe to use it. I like your site by the way, it’ still interesting to look into that map making program, just to play with.